9th December 1987: The First Intifada. Today we mark the beginning of the first Palestinian Intifada in 1987. Various end dates are cited, usually falling between the Madrid Peace Conference of 1991 and the Mehola Junction bombing of 1993, but arguably the conditions and enmities created during those first years have characterised Israeli-Palestinian relationships ever since, however one chooses to draw the timeline. Remember the Gulf of Mexico oil spill? Remember we were told it wasn’t as bad as “the environmentalists” were making out? And remember we were told that the well had been capped and the problem solved? Apparently we weren’t told the whole story. Dr. Tom Termotto is the National Coordinator for the Gulf Oil Spill Remediation Conference. He’s been reading and collating the various studies and reports produced about the BP / Deepwater Horizon explosion and subsequent oil spill in the Gulf of Mexico. Last week he released a report that calls into question the notion that this disaster has been successfully contained. Indeed, it appears that even the worst case scenarios being discussed when the disaster was at its most prominent fail to convey the seriousness of the situation. Now, I’ve just read his report (republished on the Phoenix Rising from the Gulf blog), and have not independently verified any of his facts. I’m stressing this because, while I’ve feared for some time that we are being comprehensively lied to about the Gulf of Mexico oil spill (there were numerous discrepancies in the media reporting of the story that rang alarm-bells for anyone with a knowledge of petroleum geology), the conclusions reached by Dr. Termotto are startlingly extreme. He alleges that large sections of the seabed beneath the Gulf of Mexico have been destabilised by the extensive oil and gas drilling operations taking place there. Furthermore, the Deepwater Horizon explosion created numerous fractures in the already unstable rock strata and now, in his words, “the Gulf of Mexico is slowly but surely filling up with oil and gas”. On top of that, because of the depth of the oil and gas deposits, they contain high concentrations of radioactive isotopes. 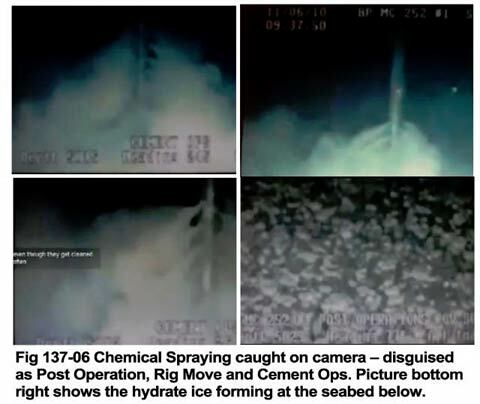 To add to the problems, the chemical dispersants — which he claims are still being used underwater near the well head (see image, below) — are making a very serious problem a lot worse. These chemicals are themselves highly toxic, but even worse… they are reducing the oil droplets to a “micronized or nano-sized state”. This significantly increases the likelihood that large quantities of mildly radioactive crude oil is entering the food chain. As Dr. Termotto says, this is turning “an extremely serious regional disaster into an unmitigated global catastrophe”. And there’s more. The leaking of gas from beneath the seabed is producing large build-ups of methane hydrates on the floor of the Gulf of Mexico. Given that the area is seismically active, this has the potential to spark a disaster should this build up be dislodged en masse. The entire Gulf of Mexico has become an environmental timebomb that threatens the health of the world’s oceans. A complete moratorium on drilling in the area is the only sane response to this information, if it is shown to be valid. However I suspect that in the face of peak oil, neither the US government nor the oil companies are interested in examining Dr. Termotto’s findings, let alone acting on them. The rush for short-term profit is killing our world. At 10:40 this morning, it was announced that “EU finance ministers have formally approved the €85bn rescue package for Ireland along with its terms and conditions”. Brace yourself for a shitstorm, Ireland. And to the rest of Europe I say… “witness your future”. It’s starting to look like a fait accompli. Barring either a popular revolution or a massive swing to the left parties (Sinn Féin or The United Left Alliance) in the New Year election, the Irish people are to be saddled with a huge debt they did not run up. It’s like a nightmare from the 1980s. Like nobody’s learnt the lessons of the failed IMF interventions, the Long Depressions and deprivation, the political extremism and social fragmentation. Imposing these kinds of policies in the face of an ongoing global recession is utter madness. I’ve heard all the conspiracy theories about why the institutions of global capitalism would want to provoke this kind of economic collapse… but none of them convince me. They require too much vision from people we know have none. They require a level of organisation from the political elite that their overt incompetence precludes. Later this afternoon, the government will reveal what is widely expected to be the most draconian budget in the history of the nation. The minimum wage will be slashed by almost 15%, welfare payments will be cut to the bone and the public sector is likely to be gutted. Meanwhile individual taxation will rise, but tax on corporate profits will not. Beyond that, what few state assets that were not privatised during the boom years will be flogged off — probably to the same international financial institutions that created the massive debt now being transferred to the Irish taxpayer. And it’s all so bloody unnecessary. Yes, the Irish government needs to balance the books. We are spending more than we’re earning and that’s unsustainable. But the idea that the best way to balance the books is to dump a hundred billion euro of private debt onto the state is beyond insane (and there are sensible people suggesting the 85 billion could turn into as much as 220 billion before this whole thing is over). It’s free market ideology run riot. And what’s more, it’s clearly not going to work. Ireland couldn’t generate that sort of income even in a global environment of massive economic growth. So, with the spectre of energy shortages looming ever closer and the consequent global depression, we’re out of the realm of extreme optimism and into sheer delusion. Which is why the “bail out” and today’s savage budget are unnecessary. Ireland will default on this debt. Anyone who suggests otherwise (I’m looking at you, The Government) is a blithering idiot. We will default on the debt the markets have saddled us with, and possibly withdraw from the single currency. The only choice we have is the manner in which we do this. We can do it now while we still have some assets and a cash reserve. Or we can delay it for a few years by delivering those remaining assets into the hands of global capitalism. Our leaders have chosen the second option and have thereby guaranteed themselves a place in history alongside Quisling, Pétain and other collaborators with external tyrants. The conditions of the bail out, for example, include transferring our last remaining cash reserve — the national pension reserve fund — into the banks, so that the banks can repay the bondholders. It’s criminal, and those responsible will not fare well in the long term. I’ll write some more about this over the next couple of days once I’ve heard the budget and digested the implications. Let me conclude with a short video. Although it’s a speech from a US senator and deals specifically with US policy, it resonates far beyond. And it should be required viewing for those about to open our doors to the rapacious hyenas of international finance. I swore I’d never use the bloody thing again. And none of my past objections have suddenly become invalid. But a couple of things have arisen lately that forced me to reconsider my participation in the CIA’s big social media experiment. Firstly… pretty much everyone I know has succumbed. Now, I’ve never been massively affected by peer-pressure, and it’s not the fact of their participation that has changed my mind. Rather it’s that I live in a different country to almost all my friends, and facebook has become the de facto medium of communication for many in my old social circle. Simply by excluding myself from facebook, I’ve ended up severing ties. Secondly… and this is the straw that broke the camel’s back, not a reason in itself to join… as someone who presently earns a (meagre) living as a freelance web developer (WordPress customisation a speciality), facebook has become too big to ignore. Two clients in the past month have asked me how to integrate their websites with their facebook accounts, and all I’ve been able to do until now is shrug my ignorance. I have very little idea of what goes on behind that blue and white login screen, so can’t really advise anyone on how best to use the site. So yes, I’ve reactivated my old account. But don’t take that as an endorsement of the sinister system… consider me ‘press ganged’.